Last year was ROUGH. And this year will be ROUGH too. In some ways I anticipate that 2006 will be even harder for me than last year. Last year I got to be naive for a little while. The girls were just home from the NICU and I had high hopes that everything would go fine. Eden's hearing loss was diagnosed in April, then we got the PVL and Cerebral Palsy diagnosis in August. At least I had 7 months to hope for the best. 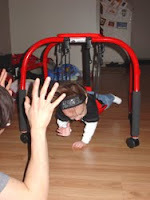 Even after the diagnosis we were still optimistic that Eden's physical disability would be mild. Now that her adjusted age is almost 14 months I am not feeling quite so optimistic. Eden has such an incredible personality. She is beautiful inside and out and her lust for life shows in her eyes and goofy smiles. She amazes us every day with her determination and sheer will-power. She wants to do so much, but everything is a struggle for her. It really, truly breaks my heart. I am having such a hard time dealing with this. I feel sad and worried everyday. I have shed so many tears and I really don't know how I can go on like this. It's hard for me to talk about, especially because I feel like nobody could possibly understand how I feel unless they have experienced having a child with a disability. It's interesting how people react when I talk about Eden. It really makes some people uncomfortable when I even say the word "disability." The reality of the situation is that Eden may never be able to walk, and may have to use a wheelchair. I can't live in denial of this fact. I am reminded of it everyday. 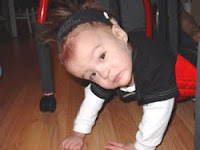 Based on her adjusted age, Eden should be walking, yet she is not even able to hold her head up very well and cannot sit without a lot of support. Everything is hard for her. Just playing requires so much concentration. I think it must be especially hard with twins, because everyday we look at what Holland is doing and are reminded of how far Eden has to go. I feel joy for Holly every time she achieves a new milestone, but at the same time it sends me into a whirl of grief over how delayed Eden is. I am so afraid about what the future holds for Eden. I need to be strong for her. I hope that someday I can get to where I need to be to be a good parent to her. My resolution for the New Year is to get closer to that place, wherever it is. If it even exists. We meet a lot of other twin parents when we are out and about. Those with older kids always say "don't worry, it'll get easier." I don't believe them. And I'm jealous. I want to live in that world where it gets easier. I'm so sorry. I don't know what else to say. I just want you to know that I care and wish, with all my heart, that there was some way I could help. My prayers are all I have to offer. And I do pray for you, John and each precious little girl. You already are where you need to be to be a good parent for both of your girls.You are exactly what and who both of your girls need and want. I can't say I know what your going through. I am a mother of a child with brain dysfunctions. She looks "normal" but doesn't act her age. I have to take it by each moment. I can relate to many of the feelings you described. At times I too find myself feeling jealous of other parents. This is my reality. No matter what I do it may not get much better. At times life can feel even worse when something unpredictable occurs. Sometimes I think it would be easier if she had a noticable disablility. People stare, make rude comments, and exclude us from everything. Can I say life gets easier, no. When moments are good I do try to focus on what she can do and smile with her. You have such a caring and supportive family. Be grateful for that. Not everyone has that. May the new year come with many moments of joy. You and your family will continue to be in my prayers. You are right--no one who has not/is not experiencing what you are could possibly understand how you feel. I do want you you know, however, that I've always been able to "feel" the love you have for your daughters when you write about then. It comes through in your words, and if I can feel that, I can only imagine how Holland and Eden must feel it. We have so many dreams and expectations for our babies, and when it becomes evident that our notions of how our children will grow aren't necessarily going to be realized, well, it's just devastating. My prayers are with each of you. You are right, I have no idea what it is like for you. I can't imagine how tough it is. But I do know something, and that is that you don't have to wait and hope that someday you get to the place where you can be a good parent to her, as you said. You are already there. In fact you have long since left being good, and moved into great. I only wish you and John both could see what we, your friends and family (including your daughters) see and experience every time we are around you or read your posts -- two of the most amazing parents i have ever known. I mean that with all of my heart (and you know I aint one to BS) :) My heart goes out to you, Billie. Know that I am here if you need anything. P.S. Seeing the girls was, as always, a highlight of my trip home. Thanks! You are such an exceptional parent to Holland and Eden. You're the best you can be, it shows in their pictures. I can't imagine what you're going through, but I hope for you the best. I am sure 2006 will be better than you think. I will keep you and your family in my prayers. 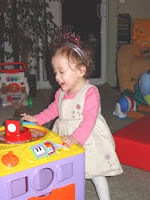 I found your blog a few months back...just before Eden's cochlear implant. Life with a disability is not easy, I know. My son has several disabilities, including deafness (4 years post implant). Just wanted to encourage you that the valleys get farther apart; they really do. Hang in there. Your family is precious! You're in our prayers. I dont know what to say that could make you feel better. But you are the best parent for your children. They are lucky to have such a wonderful loving mama! All you can do is get Eden as far as she possibly can go and know you did everything for her. I hope that it does get easier for you. But know my thoughts are with you and your wonderful family. It breaks my heart to hear that you are so sad and depressed. I don't know exactly how you feel, but I know what its like to wonder if your child will be alright...Merry has had her share of troubles, but she's doing okay right now...and you know what? Eden will be okay as well. She has two wonderful, loving parents...and she has grandparents, aunts and uncles who love her and are praying for her. She has people all over the world who pray for her and love her...and I KNOW...and BELIEVE that God has a miracle in store for you. Oh Billie, I'm so sorry about all that you and your family have endured. When I first found your blog I hadn't realized the extent of Eden's situation until I read your recent entry. The love you show for your children warm's my heart, which is also so saddened by how hard everything is. I can only tell you that I feel for you, I can only understand the pain of what I've gone through so far - although different, loosing a twin I think is as terribly difficult as finding out one twin has disabilities. Not knowing what the future holds for my surviving twin is an ever present fear. All my best wishes to you, I wish I could say/do more to help. Your fearless honesty and preternatural self awareness shine through in everything you write and I think that these qualities will get you where you need to go. In the meantime, if it helps at all, you continue to be a true inspiration to me and, I am sure, many others. I read your post this morning and just wanted to write and tell you that I am so proud to know you and John. I told Lisa after visiting that I cannot imagine how busy and tired you must get (and John too!) It warmed my heart to see how he just jumps in there to do what needs to be done, you are very fortunate. I could never attempt to know what you go through on an every day basis in your worries for Eden, but I do know that with you and John behind her as parents Miss Edie will prevail to the best of her ability, and there is no doubt that her spunky sister will be one of her strongest supporter. Things do have a way of working out sweetie, it's not always the way we would have dreamed it, or planned, but I too feel that Eden may just surprise all of us. She may have her limitations physically, but her spirit and sweetness have no bounds! Hang in there Billie knowing that you all are loved and thought about daily. It helps me to remember sometimes when I'm feeling down that it could always be worse. Dear Billie, I am so sorry to hear how tough things are. No one would choose to deal with your situation as first prize. Yes, your girls are beautiful and wonderful and you are blessed, but it is also damn hard for you. I had no idea Eden's disability was potentially this big. Every parent wants the best for their child, for their child to be able to achieve every thing they want to, and I can only begin to imagine how heart breaking it must be to see your daugther struggle. Life can be so incredibly unfair sometimes, I am so sorry. Eden is such a beautiful, special child, it is so unfair. Billie, it really hits home when you write about the differences between your two little girls. My twins are totally opposite in their development. Hallie is falling further and further back everyday. It so hard to believe she is one and cant sit up but i know you know more about this feeling then anyone. I keep thinking of her as a newborn and the reality is , she is one now. I love reading your blog about Holland and Eden. You are always so positive in speaking about them. Your love for them is shown in all that you say. I dont wish what i go through on a daily basis on anyone, and I feel like you have it worse. I can remotely feel your pain. I, too, love my children with all my heart. I just know mine deserve more then what they are getting in life, and that is when i feel the pain. All of our children are beautiful in their own ways. I keep telling myself that God only gives you what you can handle. I just sometimes think to myself, can i handle this? My prayer will continue to be with you and the girls. I cant promise things will get easier, but you will love her more and more everyday for all the special things she does. Stay strong for them both. They will gain strength from you. The phrase that deals with "walking in someone else's shoes" is true but yet not true. No matter what the situation, no one deals with the same things. We're all different individuals with different personalities and each of us handle things in our own way. No one can feel what you feel just as no one can feel what I feel, but we can have empathy for one another. I've wondered if you and John have your down times. I know I have while raising my children, worrying that they would fit in with others, worrying that they could learn as others. It's because we love our children and only want positive things for them. The greatest gift you can give either of your girls is unconditional love and you do that already. They are blessed and it shows in their smiles, in their expressions when they look at you. What you've given them will be what helps them make it in their lives and in the future. We don't always get to choose what happens to us in this life but we have a God who can help us endure and make the best of what we are given. You'll succeed. Lots of us worry about our babies and cry. As one person said, crying does help. All you can do is what you are doing. Just keep watching those two little wonders of yours advance, and they will. If each advances differently, that's okay. That's just the way it is. You're in my prayers. I love and respect you very much. God bless you. Connie W.
Billie, I really feel for you. My situation is different, but dealing with a son with special needs, I can say it did get easier. But then, it got harder again. Easier, then harder; every day brings something different. New joys, new sadnesses. And even though there are a lot of bad days, there are good moments and days too. They don't change things, but they help a little. I can only imagine how hard it is to not compare the girls' development. Even though my sons are two years apart, I found it hard to enjoy my youngest's development because it always reminded me what my older son couldn't do. But it also taught me to appreciate every small achievement so much more than other parents might. Your girls are beautiful, and I know you will do the best for them. They seem to be very happy, and they have the best gift in the world: each other. It will be a long road, but I know you will help them both fulfill their potential, and beyond. I'm sorry you are feeling discouraged, although it's only natural at times. I did not realize Eden's CP challenges were potentially so severe, as well as the cochlear implant story. I know what it's like to have preemies, and to worry about their development, and to try not to compare them. It's hard. But I don't know about having a child with serious medical issues as E does. Are you a member of the N.O.M.O.T.C., through your local group for parents of multiples? I wonder if there are networks for parents of multiples with special needs, and if you might find some fellowship and support there. I know we have a network like that in Canada. I will pray for many wonderful milestones in 2006 for both Eden and Holland. And for strength and courage, and many joys, for you and John. From all your blog shows, you are doing a wonderful job parenting your girls - keep up the good work! I am continually moved by your website, not only for your beautiful pictures and stories, but also for your honesty in all you are going through....I check often for updates - whether uplifting or challenging - and keep you, John, and the girls in my prayers. I have told you in the past and will repeat that I always feel that things happen for a reason, and have always felt that your girls were born to you for a very special and unique reason. I have never had a doubt that you and and John would be wonderful parents to the special gifts that you have been given. Remember every day how much happiness they have brought to your lives. Holland and Eden are special and unique in their own ways, and you love them individually for that, regardless of any differences. Think about how different your life would be now without them! I can see in your photos how happy the girls are...Just keep giving them a reason to smile and you'll feel the same. There are so many more milestones to reach and you'll love each! Hang in there! This too shall pass and you'll be reminded what beautiful children you have. My wife is a pediatric physical therapist and she sees miracles happen every day. Best of luck to you and the twins! I send my love to you and your family during those challenging times. You are a very loving "mama", and I know the girls will always look up to you for advice and inspiration. However this is no small task for you! I'm so happy you were able to spend some time at Liz and Eric's to celebrate the New Year, and promise me you'll take the time you need to balance yourself throughout 2006. Reading this really hit home to me how difficult it is to be a parent of a child with a disability. I am watching my brother and his wife go through this as well. My heart sincerely goes out to you guys, as well as my hopes for a better tomorrow and my prayers. I truly believe that God never gives us more than we can handle. He obviously feels you guys are strong enough to endure this. He also feels that Eden is strong enough to handle whatever her future holds. One word of encouragement, I look at your little twin marvels everytime I come to this site and I am amazed. I am amazed at what modern medicene is capable of. The girls have already benefitted from discoveries and advances that have occurred in the last 10 years. By time Eden is 10 years old who knows what the medical world will be capable of then! The sky is the limit and the hope is there. Keep your chin up. Be thankful for all the blessings of life. And know that many of us are out her rooting for you all.